Students will learn how to forge their own single-faced (“dog-head”) blacksmithing hammers by punching and drifting them from high-quality tool steel. 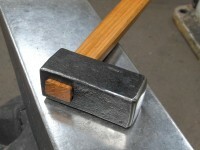 The hammers will then be finish-forged, ground, hardened and polished so that they are ready for hafting and use. Time permitting we will fit them with handles of hickory or white oak. The hammer form that we will forge in class is based on several blacksmith’s hammers that were excavated from Viking blacksmiths' graves in Norway, and which coincidentally also strongly resemble hammers used even now in traditional Japanese bladesmithing. Class space is very limited. Students will be registered in the order that their payments are received. Traditionally Welded Hammers: When steel was an expensive resource, hammers and other tools would be shaped from soft iron and faced or edged with high carbon steel to give them toughness against damage and wear. The cost of the tools was reduced and the complex forging of the tool forms was executed in soft iron, which was much easier to work than the tougher steel. Students should bring leather gloves that are supple and a little loose to help protect their hands from burns, cuts and abrasions. Some used gloves are usually available at the shop. Hearing protection is required to be worn and is provided in the shop in the form of foam ear-plugs. Students who need over-ear protection must provide their own.